What we love about this recipe is that it is easy to make - and it provides all the right flavors that one wants in a sandwich - the squash provides a rich, creamy base - while the coconut bacon adds that umami depth. Topped off with a spicy vegan dressing, this sandwich will please even the non-vegans in the room. 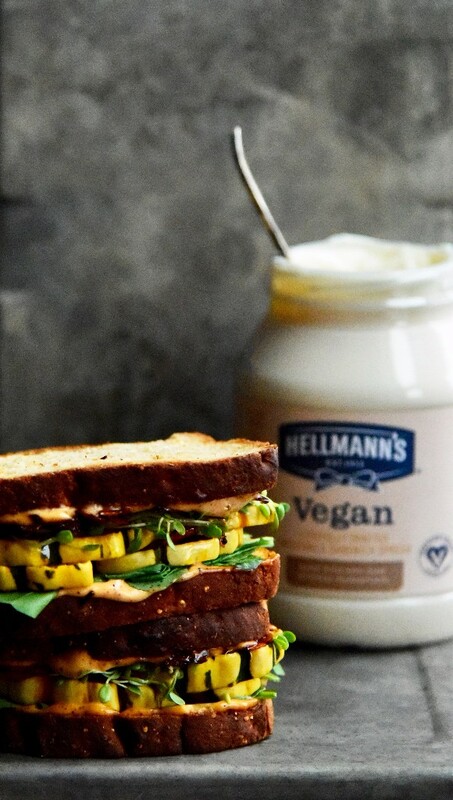 We used Hellmann’s Vegan Carefully Crafted Dressing and Sandwich Spread as the base for our spicy sauce. It is made with carefully selected ingredients, is eggless and made with non-GMO sourced ingredients. What made this Dressing and Sandwich Spread so great is that it provided just the right base for adding chili powder, paprika and hot sauce to kick up the heat on this sandwich. Preheat oven to 350 F. Combine all ingredients for coconut bacon in a small mixing bowl. Mix well, and spread evenly onto baking sheet (try to make sure pieces do not overlap). Bake for 5 mins. After 5 mins, take the coconut bacon out of the oven and stir, dispersing the pieces evenly. Bake for another 5 minutes, or until crispy and browned. While coconut bacon is cooking, wash and cut delicata squash in half lengthwise. Scoop out the seeds and discard. Cut each half of the delicata into 1/2 inch segments (half moon shape). Place on baking sheet and drizzle with olive oil, salt and pepper. Increase oven temp to 375 F and roast for 20-30 minutes, or until slightly browned and tender. Combine all ingredients for spicy vegan dressing in a small ramekin or mixing bowl. Whisk together with fork until well incorporated. Toast 4 slices of bread. For each sandwich, spread spicy vegan sauce on both slices of toasted bread. Assemble the sandwich with arugula, squash, coconut bacon, and sprouts (optional).